This tasty tart is an ideal choice for a working lunch! As an ingredient, crayfish is a low fat food with only one gram of fat per 3-4 ounce serving and no saturated fat. Included in the diet, crayfish may offer some of the health benefits ascribed to seafood in general, including protection against Alzheimer’s, stroke cancer, asthma and heart disease. 1. Pre heat the oven to 350F/180C/Gas Mark 4. 2. Mix together the egg, 75ml milk and 75g of Greek yoghurt. 3. Fold in the crayfish, sun-blush tomatoes and cheese. Season to taste. 4. Divide the mixture equally between the four tart cases and bake in the oven until golden brown and set. 5. Meanwhile, make the dressing for the salad: Blitz together a handful of fresh herbs with 100g of Greek yoghurt and 150ml of milk. Season to taste. 6. 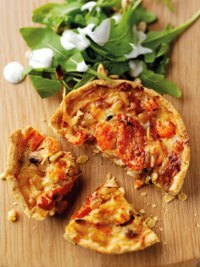 Serve each tart with a handful of wild rocket, a sprinkling of toasted pine kernels and a drizzle of dressing. Create a special stew with the taste and colour of Brazi. This is a delicious combination of smoked haddock and prawns in a creamy spinach sauce, which gives the pie a vibrant coloured sauce. Give these delicious fish fingers a go and cook them with your children today. Try this tasty Toddler recipe!